A part of me wants to believe that there is one but the other part of me does not. The same goes that a part of me believes in a higher power and the other part of me do not believe that there is only one God. As you may remember that I’m still get upset when someone say that “God has other plans for him” and I’m still angry at the higher power for taking him away from me too soon. So you may be asking why I’m questioning myself about God and the afterlife. Well something happened recently that is once again making me question my belief. Let me start from the beginning of what happened. Since my husband passed away, he left quite a mess on the property for me to deal with. My son and his girlfriend have been coming up every other weekend helping me clean up the yard and taking pictures of the motorcycles (twenty-three of them), vehicles and miscellaneous items to put on Craigslist to sell. After a long day, I decided to treat them to dinner at an Italian restaurant. Since we were close to the cemetery, I wanted to head over there to show them the paver that was installed. While we were there we noticed a bike that sort of look like a TW200 and decided to take a closer look. The closer we got, we realized it wasn’t a TW200 but it sister bike the Yamaha BW200. 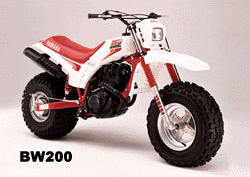 It was only produced for 4 years from 1985 to 1989 and the biggest difference between the two bikes is that the BW had a fat front tire as well on the back whereas the TW has a skinny front tires and a fat tire on the back. While looking at the bike, we noticed a lizard under the bike, not just an ordinary average looking small lizard that you skirting across the sidewalk. It was a size of a gecko. The kids and I looked at each other and shook our heads. We decided to pay a visit to the Percheron draft horse that resides at the cemetery. As we were walking over there, we noticed that the lizard was following us. We stopped midway and so did the lizard. We continue to take several steps and then stop, so did the lizard. While we were at the corral, the lizard stayed a few feet away from us. We kept looking at it and it kept looking at us. Finally, it was getting dark and we decided it was time to head on home. As we were driving out of the cemetery, we had to pass the corral on the way out and that where we saw the lizard again, inside of the corral with the horse. My late husband nickname was lizrdbrth and he loved horses and motorcycles (as his friends would say “steel horses”). As matter of fact, he rode his horse across the United States on a horse following Route 66. When I got home, I had to research to see what kind of lizard it was since I never seen it before. 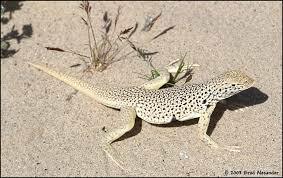 I stared at my computer screen in disbelief and started laughing when I discovered it was called a Mojave fringe-toed lizard. My late husband favorite place to ride his TW200 was the Mojave Road. God that was a great story GM….as a believer, despite all my warts….sometimes when you begin to question what is and what isn’t, and we all do….something like your experience is a wake up call…or just a slap in the kisser….. 🙂 Great Stuff! Thank you Hoot…sometimes its hard to admit these things but you have to take the power out of it by sharing about it. Hey David, unfortunately, the bike I’m taking on this journey has a plastic gas tank so I can’t paint on it. However, I just may do it on my other bike though. Thanks for sharing your heart with us. Much love! Thank you Ronnydog for being a part of our lives and continuing to support me as I pursue this journey. Nice and thoughtful words Gina. In this life we need to stop and observe – like you did. I believe that our world screams “I’ve been created!” but we humans frequently cannot see it because our spiritual eyesight is out of focus. Lizards (and other critters) have much to tell us. Please, keep sharing! Thank you Jeff, I will try to continue sharing with an open heart. This is a scary process for me but I am learning that by sharing it takes the power out of it.